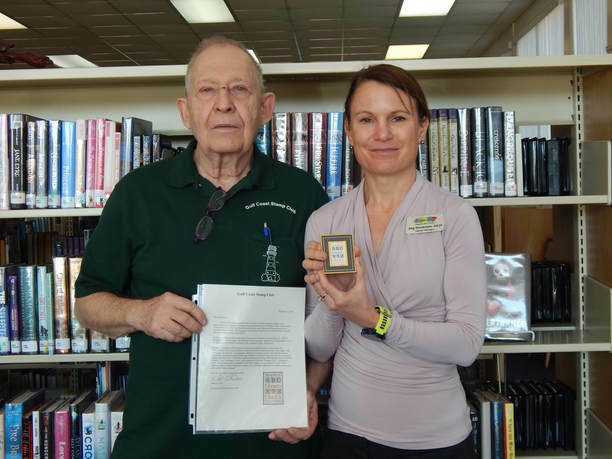 Please accept this encased 20 cent America’s Libraries stamp as a token of our appreciation for the positive working relationship between the St. Martin Library and the Gulf Coast Stamp Club. Our Club has been meeting here since Hurricane Katrina destroyed our meeting place in Biloxi. The meeting room is an ideal location for our members and your staff has always been friendly and positive. A 20-cent commemorative stamp honoring America's Libraries was issued July 13, 1982, in Philadelphia, Pennsylvania. The First Day of Issue ceremony was held in the Philadelphia Civic Center during the annual convention of the American Library Association. Bradbury Thompson of Riverside, Connecticut, designed the stamp, which honors the contributions of our nation's libraries to the growth and development of the United States. “Mr. Thompson, an authority on typography, depicted in his design letters of the alphabet and the geometric construction grids used by type designers to shape and form letters for the printing of books and other items.” The letters depicted are from a rendering of the alphabet done in 1523 by Geofroy Tory of Bourges, France, which appeared in the book "Champ Fleury," published in 1526. The typeface used is compatible with Tory's original. It was originally cut by Tory's famous student, Claude Garamond, in about 1532, and today is known in its updated form as the font called "Sabon Antigua." We look forward to a long relationship. Stamp Tagging is one of the most intriguing parts of modern philately. With a simple UV detecting device you can uncover rare varieties of otherwise common stamps, significantly increasing the value of your collection. In the early days of US mail, letters were stamped and sorted by hand. This was of course an extremely time-consuming process. By the early 1960s the Post Office Department (now called the USPS) began looking for a better way to process the mail. The machines first needed to find the stamps on the letters before they could be processed automatically. Tagging the stamps with phosphorescent coating allows them to be easily seen under shortwave UV light. Ultraviolet or UV is broken down into different divisions. Shortwave is 200-300 nm (nanometers) and longwave is 350-400 nm. If you've ever seen a black light poster then you can visualize how bright the colors stand out. A standard black light won't show tagging, but the concept is the same. When tagging (zinc-orthosilicate) is exposed to strong shortwave UV light, the stamps glow a bright color that ranges from yellow-green to bluish green. Without the UV light the taggant is clear and virtually invisible to the to our eyes. Once the machines were able to locate the tagged stamps, the letters could be automatically turned (faced) and then cancelled. Tagged stamps were first introduced to the public at Dayton Ohio in 1963. This has saved the government big bucks and uncounted labor hours over previous methods of sorting and processing by hand. This is a modern machine called a culler-facer-canceller that is used to perform all of the jobs for us! OK, here's the big secret: The machines don't actually "read" the value on the stamp; they merely detect the stamp, position it, and cancel it. There has been some controversy in the past over folks purposely mailing letters with not enough postage and getting away with it since the machines don't know that exact amount affixed. You should always properly frank your letters with full postage. There are 3 main ways that tagging is applied and then variations among the types. Some issues like Johns Hopkins of the Great Americans Series have 5 different combinations of tagging and paper types. The first tagging method ever used is called overall tagging. Liquid taggant was spread onto a rubber mat or cylinder and then transferred to the surface of the stamp. Johns Hopkins (2194b) above right is a visual example. Left is the same stamp under normal light or the appearance of an untagged stamp under UV. In most cases the taggant is "over all" of the stamp and the appearance is grainy. The flexible tagging mat sizes don't always completely cover the sheets of stamps and result in untagged margins. This is one easy way to tell it apart from prephosphored tagging, which always completely covers all stamps and margins. Overall tagging is still used today. Overall tagging is a clear coating that is applied to stamps after the design has been printed, but usually before perforation. This is done so that the liquid tagging doesn't flow through the perf holes onto the backs of the stamps. When viewing under UV, you are looking through the haze of the fluorescence to see the stamp design below. This tints the design green and often masks the true colors. The surface taggant will actually rub off onto your fingers fairly easily. The second main type called Block tagging occurs when it is applied to the surface of the stamp in a block shape. Johns Hopkins (2194) above shows block tagging. The sizes of the blocks vary greatly with each printing. Certain catalogue numbers are assigned by the size of the block alone. Gilbreth and Laubach at the top show small and large blocks. The rubber mats also wear over time and there are unlimited varieties caused by this wearing. These include flaking, cracking and breaks. At times the impressions of stamps are actually worn into the mat. The stamps are then tagged with a ghostly transfer image of the design. This is the third main method of modern tagging. The taggant is added to the raw paper before the vignette is printed. The final appearance of prephosphored tagging depends upon the coating that already exists on the paper. Prephosphored coated stamps have a very solid appearance under UV like Hopkins (2194d) above. The coated paper allows the taggant to attach evenly to the surface of the smooth paper. Sometimes it is difficult to tell the difference between Overall tagged and Prephosphored tagged stamps. Since prephosphored stamps have the design printed over the tagging, the stamp design usually appears much bolder in comparison to overall tagging. (With OT the design is under the tagging). Prephosphored uncoated stamps have a mottled or grainy appearance under UV. The paper is uncoated so the taggant soaks into the paper and pools in the fibers in an uneven way. The result is an often fainter tagging, which is occasionally bluish under UV by comparison like Hopkins (2194e with below. U.S. Airmails from C59 to C90 glow an orange-red color (calcium silicate) under shortwave UV (instead of green) and are overall tagged! Airs from C91-now glow green. Stamps can also be printed with the phosphorescence added directly to the printing ink. The result is a stamp that glows only in certain parts of the stamp design where that ink is applied. Taggant can also be applied in a band or a stripe that runs across several stamps. At times more than one of these methods are combined! Under shortwave UV light, they show no reflective glow. They occur accidentally when tagging is missing or only partially applied during printing. They are considered an error of missing color. Finding an untagged error is thrilling. Often they are literally hidden in plain sight! Modern stamps denominated 10c and under are intentionally untagged. This is done to prevent the low-values from triggering the canceling equipment. Precancels and service inscribed stamps are not usually tagged because they are routed differently and not cancelled. Sometimes the tagging coincides with specific types of paper and the tagging type can be determined without even using a UV lampby simply turning the stamp over and inspecting the gum! Ready to buy a lamp and get started? To see tagging you need a shortwave UV lamp. Most shortwave UV lamps today emit at 254 nm and with the proper filter will reveal stamp tagging. There are basically 2 types of UV stamp lamps -plug-ins (left above) and portables (above right). In my opinion Raytech Industries make the best tagging lamps for stamps. My plug-in is time tested over 30 years and in use daily. It is powerful and durable and I see everything! Safe has a good battery operated model for the road. • The advantages of a plug in lamp are that the powerful bulb and filters allow you to clearly see all taggant. Many counties other that USA use tagging and a good lamp will show all of the variety. • Often these heavy-duty lamps have a switch or slide that will allow you to also see long wave UV 350-400 nm. Long wave fluorescence concerns ink and paper brighteners and is different from tagging but useful to specialists (lamps are often 366 nm). • Portables or battery-operated lamps are good for shows and times when you don't have electrical access. • Battery operated portable lamps are inexpensive. NEVER STARE DIRECTLY AT THE BULB! • Plug-ins get hot and continued long-term exposure to the light can damage your eyes. The light can cause a "sunburn" type irritation. Wearing glasses can reduce the effects. The lamps are typically safe when handled properly. • Plug-ins need to be plugged in and access isn't always available at stamp shows, etc. They are bulky and heavy if you don't have a UV stand to hold the light. They are expensive. • Portables are unfiltered and weak in comparison. Often it is difficult to tell the more subtle differences. Portable lamps can emit so much white light that faint tagging is lost in the glare. A UV lamp is an essential item for serious Machin stamp collectors. So what's the difference between short-wave and long-wave UV and what do these specific lamps reveal? Most British stamps can be readily identified by their values, design, colour, perforations, watermarks and other visible or measurable characteristics. But for collectors of modern British stamps, especially the Machin series of definitive issues, the fluorescence of inks, the phosphor bands and coatings may need to be seen to properly identify stamps or confirm errors and varieties. A short-wave UV lamp will clearly reveal most of the different phosphor bands found on Machin (and other) stamps. It becomes easy to spot "short bands" and reveal paper differences including the all over phosphor coated papers. It also enables you to check stamps that appear to have missing phosphor bands to the naked eye and avoid expensive mistakes when the presence of phosphor is only confirmed under UV light. Long-wave UV light helps reveal the often subtle differences between yellow and blue fluors and can also check for less frequent afterglow characteristics. While all phosphor types have an afterglow under short-wave UV, only a few possess the same properties under long-wave UV. Long-wave UV will also reveal the fluorescent characteristics of some printer inks. It's not just collectors of modern GB stamps that can benefit from viewing stamps under UV light. Repairs and paper thins can seriously affect the value of all stamps from the Queen Victoria era onward and viewing under UV light can often reveal paper faults or repairs that are virtually invisible to the naked eye. In addition to fault checking, some stamps from the reigns of King Edward VII and George V have fluorescent characteristics which can help distinguish between printers and confirm stamp shades etc.